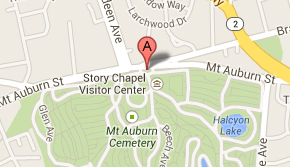 Work will begin in March on a two-year exterior masonry repair project at Story Chapel. The project will include rebuilding many of the building’s stone buttresses, extensive repairs to the stonework on the upper portion of the chapel’s tower, and 100% repointing of the exterior masonry joints. Ongoing moisture issues related to deterioration of the stonework necessitate replacement of a significant amount of the stone at the buttresses and throughout the building. The original red sandstone quarried in Potsdam, New York, has been susceptible to splitting along bedding planes, opening up gaps in the stone and contributing to failed masonry joints through which water can penetrate. The Potsdam sandstone is no longer quarried, so identifying a replacement of stone has been a challenge for maintaining the building. Working with architects at McGinley Kalsow and Associates, a suitable red sandstone from Locharbriggs, England was identified in 2015, and has been used on two smaller repair projects in order confirm that it will be a good substitute. When dry the replacement stone is a very close match in terms of color and it was used successfully in a pilot project last year reconstructing buttresses at the southeast corner of the building. The pilot project also provided us with an opportunity to test different mortar recipes for compatibility, color, texture and workability. For well over a century a beautiful Purple-leaf Beech tree (Fagus sylvatica ‘Atropunicea’) has graced the front entrance to the Cemetery and greeted visitors. Beloved by staff and visitors alike, its large wrinkled trunk and vast canopy delighted and impressed all who enter the gates. A fungal disease that has plagued this tree for more than 10 years has now compromised the Beech’s health to the point where it is no longer safe to leave standing. It is with a heavy heart that Mount Auburn will remove the tree the week of February 4th. The Cemetery’s collection of trees is one of its most prized collections and one that our horticulture staff goes to great lengths to preserve. But, as with all living things, they also have a natural life cycle. Some of our trees can live a very long time, if the conditions are right. We do have many trees that are now more than a hundred years old. A few dozen oaks on the grounds are believed to even predate the founding of the Cemetery in 1831. Other trees, like our large European Beeches, become susceptible to disease and pests as they mature in age. During the past two decades, mature beech trees up and down the east coast have suffered significantly from a disease that is highly specific to that species alone, known as “beech tree decline” or “bleeding canker disease”. It is caused by a Phytophthora fungus. Larger Beech trees (those with a trunk diameter 36” or larger) are most susceptible to this pathogen. Our arborists actively monitor and treat the infected trees in our collection with a spray of Agri-Fos and Pentra-bark, which is only somewhat effective at control, working only when the infection is small and in a relatively young tree. Stress, particularly through drought, likely predisposes beech trees to infection. Our control efforts have focused on maintaining low-stress environments for the trees removing grass growing beneath them and replacing with organic mulch and providing irrigation during droughts. Mount Auburn makes decisions to remove trees very carefully, with public safety one of our primary concerns. Our arborists use a scientific approach to hazardous tree assessments, and trees are removed when they pose a serious threat to visitors or structures, including monuments. With the exception of severe storms, most tree removals at Mount Auburn are the result of trees dying from natural causes (e.g., environmental stress from drought and cold temperatures, competition with other trees, a general decline from advanced age). Disease and insect outbreaks have periodically caused numerous removals as well. When a decision to remove a tree is made, it almost always comes after monitoring the condition of that tree for many years. Stewardship of this landscape means we must also anticipate change. Extreme weather events like hurricanes and ice storms seem to happen all too often. Sudden outbreaks of insects or disease can have a dramatic impact on trees, but the slow and subtle decline of trees in old age is harder to notice. Maintaining this “arboretum” of over 5,000 trees requires us to adapt quickly to the unexpected. Years of strategic planning has given us new planting initiatives for the next 10 years that will allow future generations to enjoy this landscape as much as we do today. While we cannot keep any individual tree alive forever, we can and do continue to plant new trees every year to take the place of those we have lost. We strive to add horticultural diversity while respecting the character of our historic landscape. The grand Purple-leaf Beech at our entrance has been one of our most iconic trees for decades, but it was a row of graceful American Elms lining Central Avenue that once filled that “first impression” role. Starting in the 1960s, the Cemetery’s collection of American Elms was severely impacted by Dutch-elm disease. As reported in the 1981 Annual Report, “the loss of one particularly stately elm near the main entrance was felt by employees and visitors alike.” Just as we mourned the loss of the elms, we will mourn the loss of this beloved Beech. We are currently searching for the best possible tree to replace this magnificent specimen and hope to plant a new signature tree this spring that we will love and cherish for the next several decades. We will be compiling a digital scrapbook in memory of this beloved tree. To contribute, please send your memories and photos to friends@mountauburn.org. After years of planning and a full year of construction, we officially re-opened Asa Gray Garden with a ribbon-cutting celebration last summer. We are deeply grateful to the generous supporters who made this project possible. The Loughlin family provided the lead gift, in memory of beloved Mount Auburn trustee Caroline Loughlin, which enabled us to initiate construction. 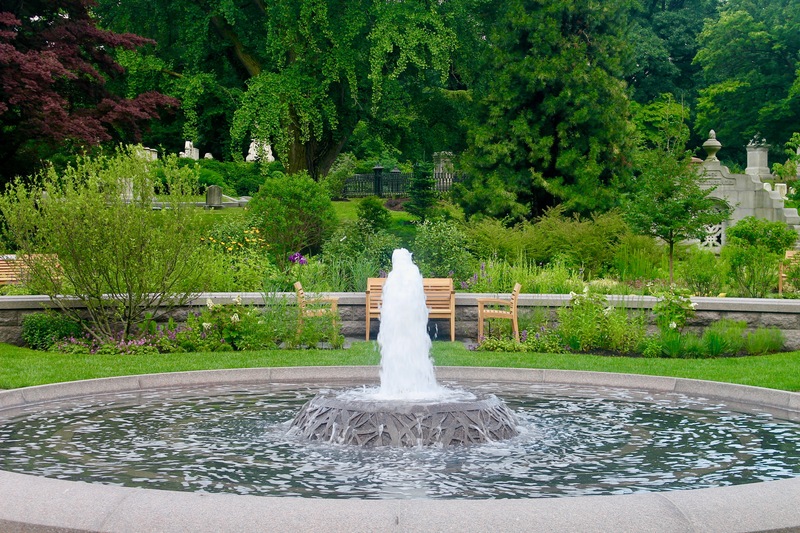 A generous grant from the Harold Whitworth Pierce Charitable Trust to name “The Pierce Fountain” was facilitated by Harold I. Pratt, and many other individuals and foundations contributed to the garden renovation. A full list of donors will be available in our 186th Annual Report. The Friends of Mount Auburn continues to welcome donations to the renovation of Asa Gray Garden to ensure that it thrives in the coming years! With the celebration now behind us, we look forward to maintaining this horticultural showpiece that will welcome and inspire all who visit Mount Auburn through all the seasons of the year.